Ghosts! Cults! Haunted Houses! Creatures! Commandos! Kissing robots! John Travolta’s many, many wigs! We have it all this week! Heavens to mergatroid, do we! Our main topic is cults in comics-azrael, trans human, Kobra vs Cobra, cult of connor, the hand, scientology, 3-d man and lots more. Bry also touches on some interesting business matters of the comic heart. 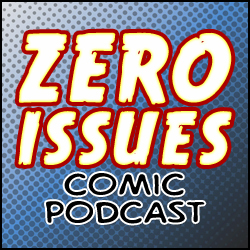 We also discuss the new trailers for New Mutants & Black Panther and the Moment of Zero is a dramatic read of Creature Commandos! What will Sarge do to save his robot buddy, Jake?!?! Oh, and the ending…. we have a very good ending and everyone is talking about this ending.